We have seen this style of shed from Treetops Traditional before, but now the 8′ x 8′ Traditional Cabin Special Deal Shed is available with a few extras and at no extra cost. As well as the generous amount of room the 8 x 8 design gives you. The door will be upgraded to a nice and wide double door and two of those four glass windows will be upgraded so that they can be opened. 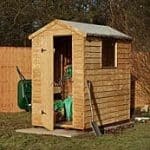 This really does give you one incredible saving and make what was already a very special and attractive looking shed even that more appealing. No matter if you are going to be spending summer nights in here with a glass of wine and the radio on or if you see this as something purely for storage, this is something that is going to make you very happy. 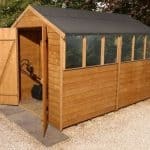 Giving the shed it’s very attractive look are some very high quality materials which have been very cleverly selected. The walls are tongue and groove shiplap cladding which protects the things you have inside from water. Also the framing is 44 mm x 27 mm thick and even has rounded edges, making this one very strong structure. Both the floor and the roof have been made using tongue and groove boarding so that they fit in with the style of the rest of the shed and also because of how strong they are. 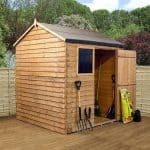 Here we have a very special deal of a shed that is going to be hard for many of you to pass up. 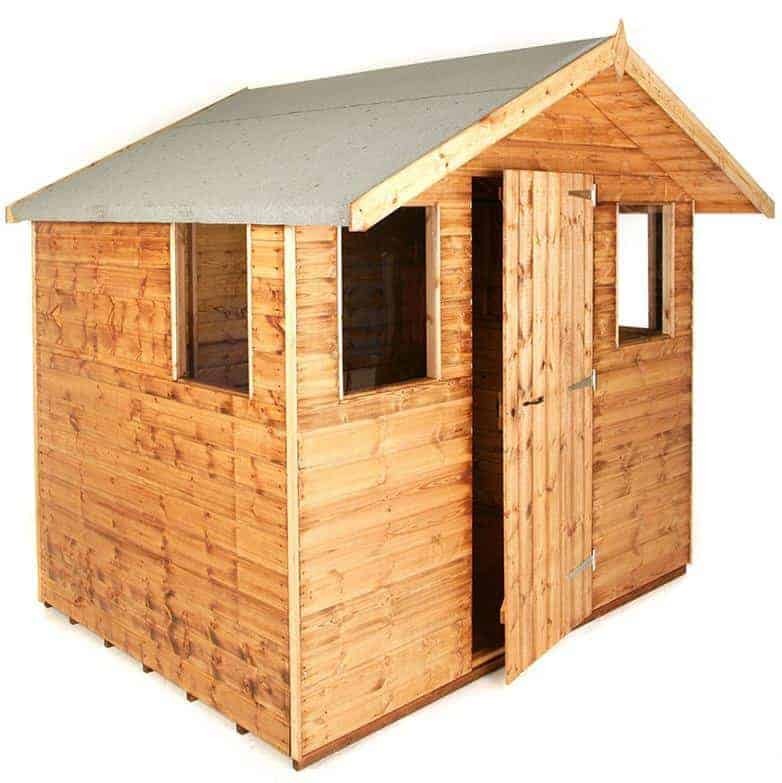 This is what we would class as a mid sized shed and with it being 8 x 8 the 8′ x 8′ Traditional Cabin Special Deal Shed gives you a very nice kind of shape to make use of. The design of this cabin shed makes it so it could be used as a place for storage, but it is equally going to be as good at being a little area you can sit back and relax in. As the width and the depth are both 8 feet, you have a decent space to organise and the height also allows you to have a few high items inside as well. The height along the ridge is 7 feet 5 inches and the eaves is 5 feet 6 inches which is right about what we would expect of a structure of this size. We really do like what Treetops Traditional have done with the apex roof. In the first picture you will notice that very appealing veranda, while this is an extra you will need to inquire about if you are interested. The overhang though is not and it really does give the shed an interesting look. Making up the roof is a covering of high quality roofing felt and some very impressively thick, 12 mm tongue and groove boards. Rain getting inside or a heavy blanket of snow are not going to be an issue for this roof. To give the shed the cabin look that it has, Treetops Traditional have used some very smooth redwood to make the 12 mm tongue and groove shiplap cladding. We really do like the way this makes the shed have a lot of personality and it is sure to get a lot of compliments from friends and neighbours. The frame that holds up that fantastic looking cladding really is quite spectacular in that it is a very solid, 44 mm x 27 mm and it also has rounded edges which is becoming something of a Treetops Traditional trademark these days. We really do like how robust this makes the shed and are sure that this is going to be a major reason as to why you are still able to enjoy this cabin shed 20 years from now. The idea of this shed is that it is going to be a place where you want to spend quite a bit of time. So with this in mind, one very impressively strong floor has been used. The floor is made with tongue and groove boarding which is 12 mm thick. This means you could put in a couple of chairs, a little table and not have the floor buckle or feel weak and cheap. Also if you do like the idea of this as something that is strictly for storage then the floor will able to handle many different heavy items. The basecoat treatment which is applied to the wood is done for free which we think is a nice little bonus. To really look after that smooth cladding though, you are going to want to give the shed a coating of wood treatment sooner than later. We always suggest that doing this in the first few weeks is the best thing to do. A fresh coat should be applied once a year to protect the wood from rot. The materials are protected for the first year of the sheds life. 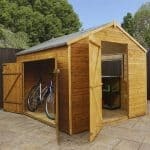 While a one year guarantee may not sound like a lot, the shed is designed so well we do not see it as an issue. You may be wondering what makes this such a special deal. Well to start with the door has been upgraded to a double door which is 5 feet 8 inches high and a little under 4 feet wide. This would normally be something that they charge for so getting it included as a bonus is really amazing. The door can be securely locked thanks to the lock and key that comes with the shed. Each of the doors is held in its place with three very strong hinges to stop the door sagging over the years. The other part of this special deal is in the form of its windows. As standard the 8′ x 8′ Traditional Cabin Special Deal Shed comes with four fixed windows with two on the front and then one on each side. These are made with horticultural glass and they will let light into the shed very well. The special deal sees two of these windows upgraded to windows that can be opened, free of charge. This would normally set you back over £30 per window so it really is a great bonus. We mentioned just before how the double doors come with a lock and key this is ideal if you plan on keeping things in here that are expensive or have some kind of sentimental value. While this is a shed that is easy on the eyes, you will be very impressed with how solid and secure it feels when you see it in person. 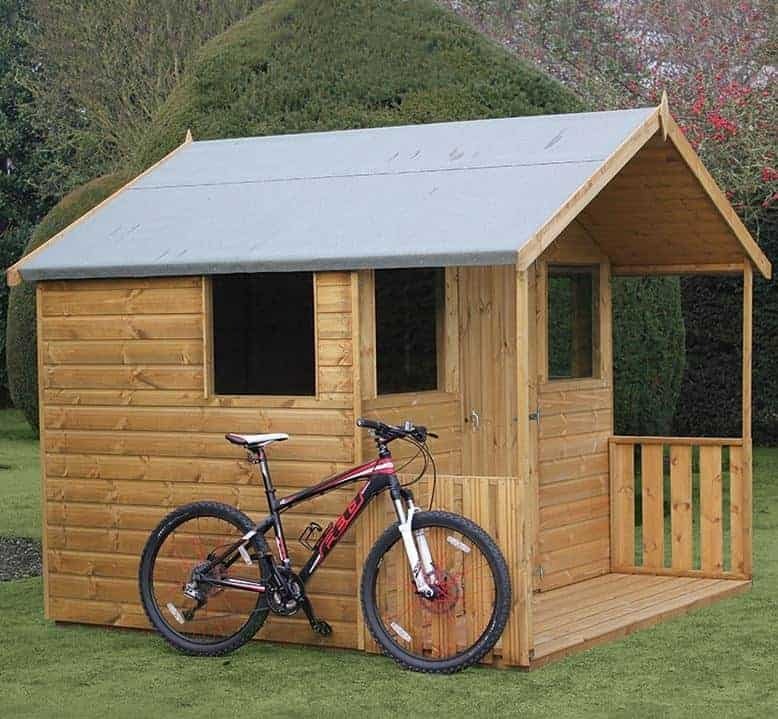 Privacy is not something this shed offers and honestly that is ok with us as if you do plan on using this as a little cabin then we are sure you will be putting in a set of blinds or curtains to give the shed a little bit of your own personal style anyway. The design and general style of this shed is something we are sure everyone is going to love and as a result, you probably are not going to want to mess with it. 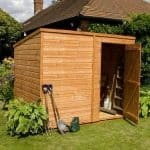 One thing though that could be done to make it fit in with the rest of your garden a little bit more is painting the shed with a wood treatment that is coloured. Normally here we would be telling you how you can pay extra to have the door be upgraded to a double door and the windows upgraded so they can be opened. But as you get them as part of this special deal, you do not have to pay for this, which let’s face it really is awesome. There are still a couple of extras available to you such as the installation service for £104.99 and the floor bearers which coast, £43.99. Also there is that veranda which you can see in the picture, but this is something you have to ask about when you order the shed. This is a high quality shed in pretty much every regard from the bottom all the way to the top, Treetops Traditional have done a wonderful job here. That frame is going to ensure this shed stays secure for many years. Plus with a little help from you, we see this being a shed that lasts you 20 or more years. This is not the largest shed in the world and if you are planning on using it as a little cabin to relax in then you will need to be clever with how you lay things out. But it's rather small stature means that it will happily fit into most sizes of gardens. 4 – 6 hours is what Treetops Traditional say the shed will take and we would agree with that. Just be sure to have the instructions to hand, a friend to help and of course a fully stocked biscuit tin and you will have a great time. This was already a shed we felt offered you good value for money, but with the added extras of the windows and the double door it really is quite an impressive deal. Final Thoughts: We were already impressed with the basic form of the 8' x 8' Traditional Cabin Special Deal Shed, but with the added double door and those two opening windows, we feel this is a shed that some people will not pull the trigger on and then a year down the line when the deal is gone, wish they had. 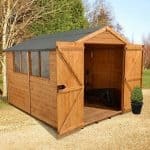 It really is a great deal and plus the shed looks absolutely fantastic and we are sure you are going to get many happy years out of this either as a place to take in a lovely summers evening or just as somewhere to keep all your gardening tools safe and secure.